Have you ever woken up to find little red spots all over your sheets? Did you know those small spots are probably blood, and bed bugs are most likely the suspects in question? Unfortunately, these bugs hide in your mattress and are typically carried around via a human or animal’s body unknowingly. What steps can you take to implement pest control targeted at bed bugs? Have you considered creating a homemade bed bug spray? Many products today can kill bed bugs, but most of them are infused with chemicals and preservatives. 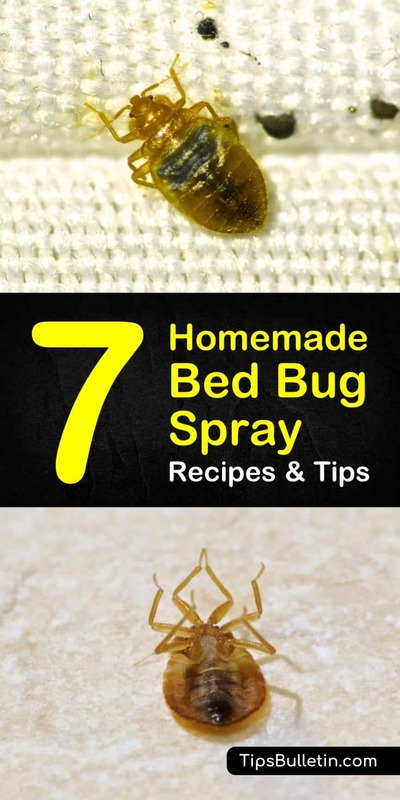 Instead, try creating a DIY bed bug spray using our tips, tricks, and recipes. Start by gathering ingredients like rubbing alcohol, diatomaceous earth, baking soda, and essential oils. Don’t worry; we will teach you what to mix and how to combine them to guarantee you’ll become a pest control professional in no time. If you’re looking for a solution to early bed bug infestation, try using the effective method known as the vinegar solution. Purchase some white vinegar at your local convenience store and fill an empty spray bottle with the liquid. Make sure you tighten the lid before spraying the solution. Soak areas where you see signs of bed bugs; this includes bed frames and windowsills in bedrooms and hotel rooms. Target all hiding places, including every crack and crevice in between furniture pieces. This solution is guaranteed to drown the little pests. You may have to do this every week for quite some time to entirely avoid the bed bug problem turning into an infestation. If you’d like one piece of advice regarding a home remedy to get rid of bed bugs, listen to this: Vacuum everything. Grab your vacuum cleaner and start vacuuming the entire house. Bed bugs are typically found under furniture, and the adult bed bugs tend to lay their eggs in the crevices of the furniture. If you start vacuuming all furniture and areas where the bed bugs can potentially hide, you’ll end up attacking their nervous system and sucking them up into the hose. In turn, this will kill them and drastically lower your bed bug count in the house. Though bed bugs love to cozy up inside furniture, they are not able to withstand any heat treatment. If you’re trying to avoid bed bug bites and you’re trying to set up bed bug traps, expose the little suckers to high heat. Take all fabric items off any furniture you have. For instance, remove all sheets, pillows, rugs, and stuffed animals. Throw them all into the washing machine and set the cycle on at the highest heat you possibly can; this will implement bed bug control immediately. There are still items that you cannot put in the washing machine, and for those, you’ll want to use diatomaceous earth. This natural substance works as a bed bug treatment by ripping through the little pests’ bodies. If you have some of these bugs hanging around in your box springs, sprinkle the substance onto your mattress and give it a few hours to settle into the fabric. After some time has passed, vacuum the remains. Essential oils like tea tree oil and lavender essential oil can typically be used as the main ingredients in fighting off some bugs. What’s more is that these oils can be combined to create the perfect spray, where you won’t have to climb up furniture to reach every surface. Stir all ingredients together in a spray bottle. Spray the liquid onto corners of your bedding and under any sheets. Using alcohol won’t typically work as a bed bug repellent, but it will get rid of the bed bugs that are roaming around in your cracks and crevices for the time being. Take 100% rubbing alcohol and mix it with equal parts of water. Put the solution into a spray bottle and soak the areas where you suspect the pests are hiding. Using talcum powder to get rid of these creatures is much easier than picking them out of your mattress and placing them in plastic bags (though this is never recommended, as you probably won’t be able to see them). This home remedy for bed bugs is super simple. Sprinkle the powder over the bed bug hotspots. You can also sprinkle the powder under all furniture that you believe is infested with bed bugs, as this will eventually dehydrate the bugs and kill them. In this article about bed bugs, you’ve discovered the best tips and tricks to creating your personal homemade bed bug spray. By using natural ingredients like essential oils, diatomaceous earth, and white vinegar, you’ve developed the perfect bed bug killing spray. Use these contact sprays and tips to protect yourself against these nasty bugs. We hope you liked our natural bed bug killer spray recipes and advice. 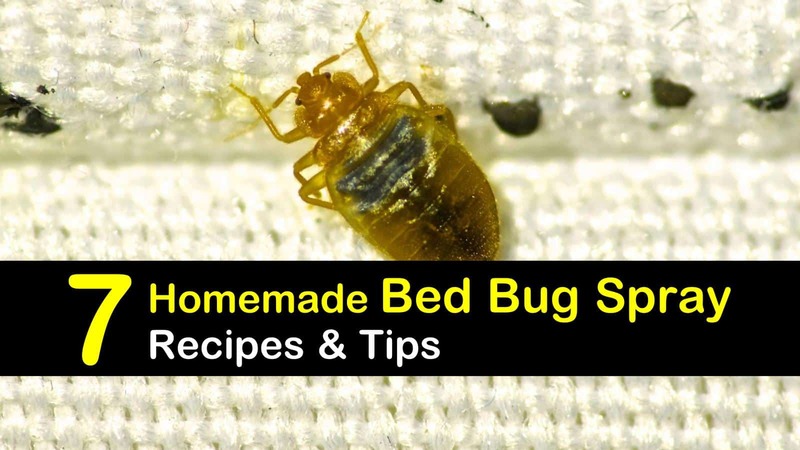 If you enjoyed reading our tips regarding natural bed bug infestation remedies, please share these home solutions for bed bugs on Facebook and Pinterest with your family and friends.